At the ENT Institute Starkville, MS. location we help our patients find solutions to their health problems affecting the ear, nose and throat, from sinus pain and allergies to hearing disorders and skin conditions. John Scott Stewart, D.O., completed his premedical internship at Grand Canyon University in Phoenix, Arizona, in 1990 and graduated from Kirksville College of Osteopathic Medicine in Kirksville, Missouri, in 1997. In 1998 he completed an internship in general surgery and his residency in Otolaryngology and facial plastic surgery at Freeman Hospital and Health System in Joplin, Missouri. 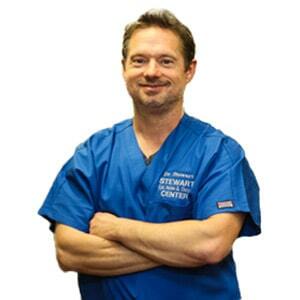 Dr. Stewart then fulfilled a one year fellowship in neurology and skull base surgery through the University of Minnesota, where he gained extensive training in all facets of otology and neurology, including chronic ear disease, stapedectomy, cochlearimplantation, tympanoplasty, endolymphatic sac surgery, acoustic neuroma, tumors of the skull base, facial nerve disorder and vestibular surgery and rehabilitation. Certified by the National Board of Osteopathic Medicine, Dr. Stewart is a member of the Academy of Osteopathic Otolaryngology/Head and Neck Surgeons, American Academy of Otolaryngology/Head and Neck Surgeons and the American Asteopathic Association. He has completed a great deal of coursework outside of his formal education, including courses addressing head and neck cancer, reconstructive surgery, powered endoscopic sinus surgery, temporal bone microdisection, head and neck pathology and sensorineural hearing loss. He has authored numerous papers on skull base surgery techniques. Very thorough and nice doctor! Very attentive. Highly recommended.